The semester was over and so was I. I had just graduated and had to move out of the dorm. 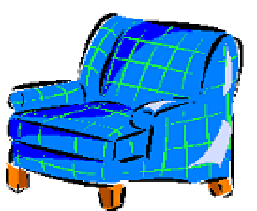 As I was packing up my things I was wondering what to do with this big blue chair and matching ottoman. I had it for the last 4 or 5 years – it was a nice chair. The Lord spoke, “Give it to Beverly.” It was plain as day, I heard him clearly, but I dismissed it as my own thoughts. I kept packing and began moving stuff. All the while I kept hearing in my spirit, “Give the chair and ottoman to Beverly”. While I can make excuses saying that I was never taught to listen and hear Jesus speaking to me, still I was listening and I was hearing him; I just was not paying attention. Finally I realized that I had to do something with that big blue chair so I thought, ”I’ll sell it for forty dollars!” Brilliant idea, my idea not God’s. I put a notice on the bulletin board and since people were moving in as well as out of the dorm I sold it in a few hours. Late that day or the next while visiting with some friends someone mentioned that Beverly had been praying for a big chair with a footrest so she could sit in her room in the girl’s dorm and enjoy reading in a comfortable chair. My heart sank. I felt as though I had just been caught stealing. I thought, “I know, I’ll buy it back!” But I could not remember who I sold it to. I missed it. I missed being a blessing and blessing someone else. I missed hearing God. The forty dollars never meant anything to me and I don’t remember what I did with it, but I have always remembered the big blue chair.